Hello friends. Today I have Tayler contributing a guest post for you all as part of a fun link up we're participating in this month. 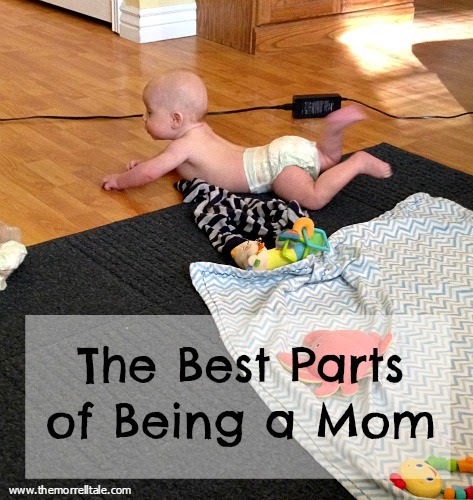 Tayler is a new mom and she wants to share everything she loves about being a mom. It's so nice hearing from other new/young moms being positive and embracing this crazy ride called motherhood. Enjoy! Hi everyone! I'm Tayler and I blog at The Morrell Tale. I am a junior high English teacher, and all around nerd/geek! I have been married to the love of my life for two years, and we still have an eternity to go! We have recently become parents to a very adventurous, very happy, very smart baby boy named Rhys. 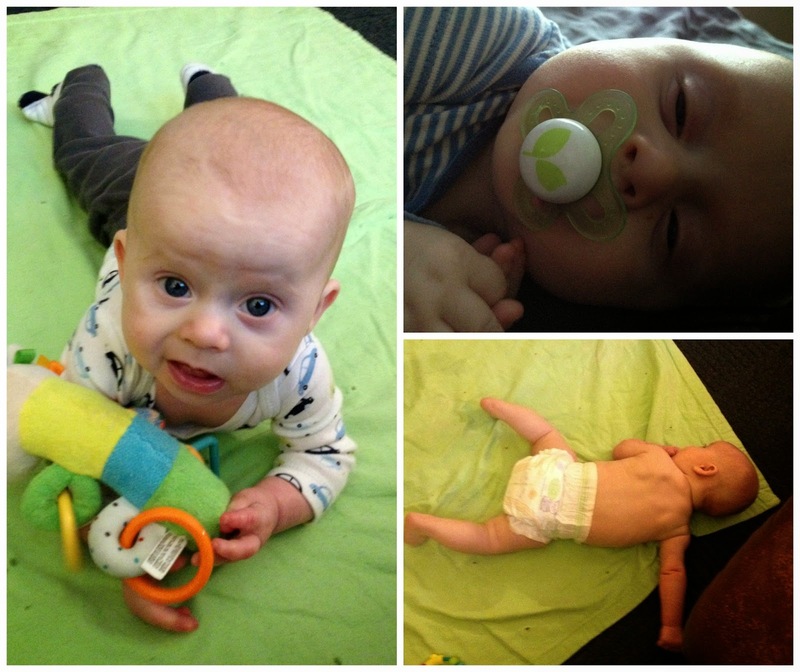 On Thursday, Rhys Michael is 4 months. So, we are still new parents and discovering what it means to be a Mom and a Dad. But, I love our little boy. He brightens my every day. I don't know what I would do without him now. -- Getting to cuddle someone whenever you want. -- Getting to play dress up every day. -- Receiving complement after complement in public about our boy. -- Using him as an excuse not to work on lesson planning or grading. -- Being able to dance like a weirdo to all the songs you'd be embarrassed to dance to (or just be embarrassed to dance, period) because he won't care! -- Smiling all day long because he smiled because you smiled! -- Learning more about how the human body works and grows by reading baby books. -- Not caring about all the time you are spending watching him fall asleep and peacefully snooze. They're adorable when they do! -- Watching them hit each and every milestone and discovering new things every day. -- Super early, before dawn, morning cuddles (even though at the time, you don't care for them). -- Seeing him reach out for you. -- Knowing that he will calm down as soon as he is in your arms. -- Already singing church hymns to him. -- Being astounded each and every day at what a miracle he is--that you and your husband created him. That you fulfilled one of God's commandments (to multiply and replenish the Earth) and that you invoked his creative powers to bring down one of his spirit children. To know that you are the steward over his religious education and his soul. To know that you can be a family forever.